Father Kevin Morris, pastor of St. Elizabeth Ann Seton Parish in Richmond, died on March 12 in an automobile accident near the eastern Indiana city. He was 63. The Mass of Christian Burial was celebrated on March 12 at SS. Peter and Paul Cathedral in Indianapolis. Archbishop Charles C. Thompson was the principal celebrant of the Mass. Father Patrick Beidelman was the homilist. Burial followed in Washington Park East cemetery in Indianapolis. Beth Van Der Burgt knew Father Morris well in her ministry as sacristan at the St. Andrew Church campus of St. Elizabeth Ann Seton Parish and in helping to lead music ministry there. In her ministry, Van Der Burgt often saw Father Morris minister compassionately to people grieving the death of a friend or loved one. Then, two and a half years ago, her own father died and she experienced that compassion firsthand. His approach to serving those who were grieving was grounded in his own experience of grief when Carol, his wife of nine years, died in 1990 after suffering from cancer for several years. 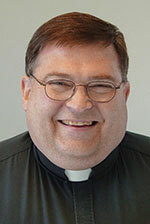 Father Riebe was pastor of the then‑three parishes of the Richmond Catholic Community when Father Morris served there as associate pastor from 1997-99. After Carol’s death, Father Morris discerned a call to the priesthood and became an archdiocesan seminarian in 1992. In a 1997 Criterion article published just before his priestly ordination, Father Morris recalled seeing a baptism of a baby and imagining the dreams the parents had for their child. Father Beidelman was ordained a year after Father Morris and spent several years in priestly formation with his friend at Saint Meinrad Seminary and School of Theology in St. Meinrad. Toward the end of his life, Father Morris experienced many health challenges. Yet his positive outlook on life never wavered, said Van Der Burgt. Kevin J. Morris was born on Oct. 28, 1955, in Bitburg, Germany, to Joseph F. and JoAnn (Mortimer) Morris. He attended Holy Spirit School in Indianapolis and the former St. Columba School in Columbus for his elementary education. A 1973 graduate of Cathedral High School in Indianapolis, Father Morris went on to earn a bachelor’s degree in business from Indiana University-Purdue University Indianapolis in 1978. He later worked as an accountant at Jenn-Air Corporation in Indianapolis. In 1980, he married Carol Bixler. She died in 1990. After the death of his wife, Father Morris discerned a call to the priesthood and became an archdiocesan seminarian in 1992. He received his priestly formation at Saint Meinrad Seminary and School of Theology, earning a master of divinity degree there in 1997. Archbishop Daniel M. Buechlein ordained him a priest on June 7, 1997, in SS. Peter and Paul Cathedral in Indianapolis. Later that day, Father Morris celebrated a Mass of Thanksgiving at St. Gabriel Church in Connersville. He celebrated another liturgy on June 8 at St. Therese of the Infant Jesus (Little Flower) Church in Indianapolis. Father Morris’ first pastoral assignment was as associate pastor of Holy Family Parish, St. Andrew Parish and St. Mary Parish, all in Richmond. He served the Richmond Catholic Community as its associate pastor from 1997-99. Father Morris then served as pastor of St. Susanna Parish in Plainfield from 1999-2012. He returned to the Richmond Catholic Community in July 2012 to serve as its associate pastor again. In September of that year, Father Morris became its pastor. In 2016, the three parishes were merged into one faith community with the new name of St. Elizabeth Ann Seton Parish. Father Morris served as its pastor until his death. Surviving are his siblings Terri Morris Downs of Indianapolis, Angela Jump of Indianapolis, Laure Taksar of Longmeadow, Mass., Patrice Morris of San Francisco and Michael Morris of Indianapolis.